When the weather is turning, all I want to do is turn to comfort food. The nights are drawing in and the temperature has dropped so salads are no longer hitting the spot! Warm bowls of soup and big helpings of pie are what’s doing it for me right now. 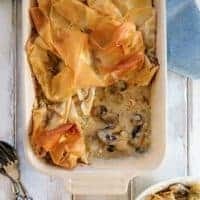 So this tasty Chicken, Leek and Mushroom pie is just perfect. It’s comforting, filling and best of all it’s low in SmartPoints! I find it best to prepare & chop all the vegetables and chicken before I start cooking (pic 1). 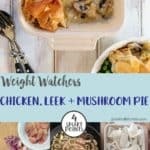 Chop the chicken breasts into bite sized pieces and cut the mushroom and leeks into thickish slices. The onions and garlic, I chop finely. Use a large frying pan / skillet as the mushroom and leeks are bulky until they have cooked down a bit (pic 2). 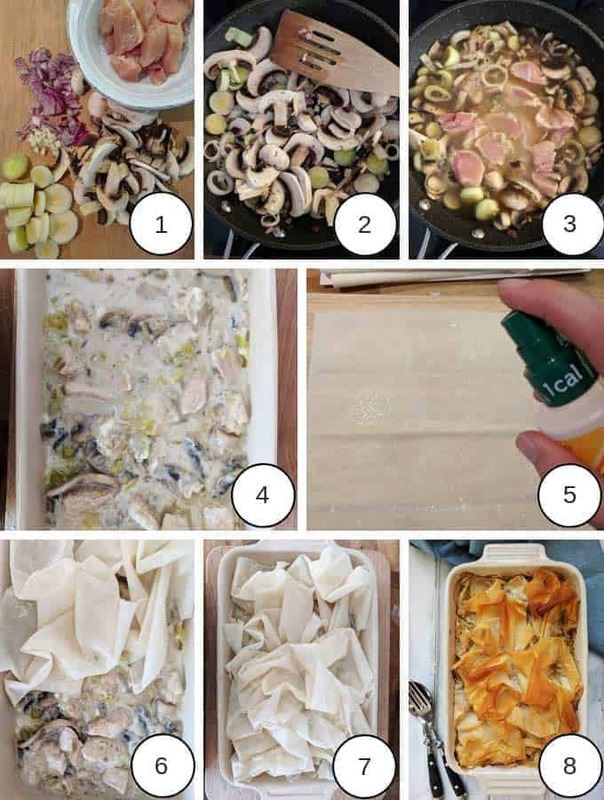 To make the Chicken, Leek and Mushroom Pie really tasty, it’s important to reduce the stock by at least a third (pic 3). Adding a third less stock may seem like an easier option 😉but believe me, the best stock is a reduced stock! The cream cheese is added to the mixture once the stock has been reduced and the pan has been taken off the heat. The mixture can then be spooned into a shallow oven proof dish (pic 4). Cut each sheet of filo pastry into 2 and spray each piece with 4 – 5 pumps of Frylight (pic 5). 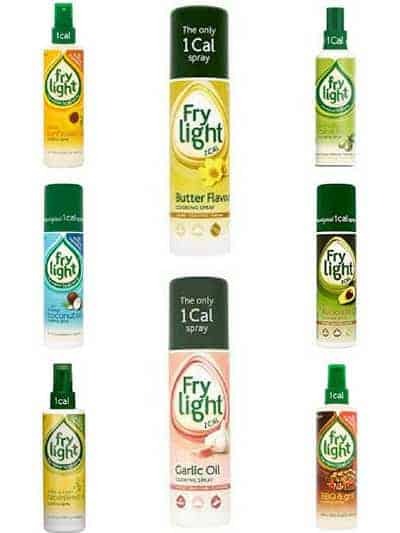 If you can’t get Frylight use an alternative low calorie oil spray, such as Pam. Loosely scrunch up the pieces of filo pasty and lay them, oil side up, on top of the creamy chicken filling (pic 6) until the pie is covered (pic 7). Bake until the filo pastry has turned a rich golden brown. You do need to keep an eye on the pie at this stage as you really don’t want the pastry to burn. Two sheets of Jus-Rol filo pastry work out at 7 SmartPoints. 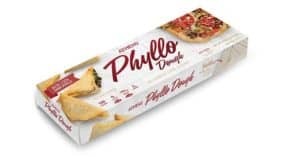 Two sheets of Athens Phyllo Dough work out at 10 SmartPoints, so either add 1 SmartPoint per serving or use 1 1/2 sheets rather than 2 sheets. Which Cream Cheese should I use? 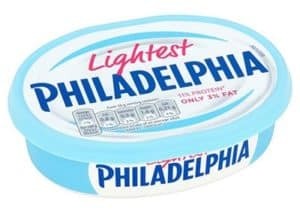 I used Lightest Philadelphia which works out at 5 SmartPoints for 150g. NB. If you use Philadelphia Light Medium Fat Soft Cheese, add an extra 1 SmartPoint per serving. 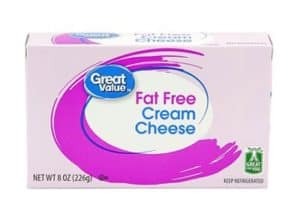 Use Great Value Fat Free Cream Cheese (available from Walmart) for no extra SmartPoints. 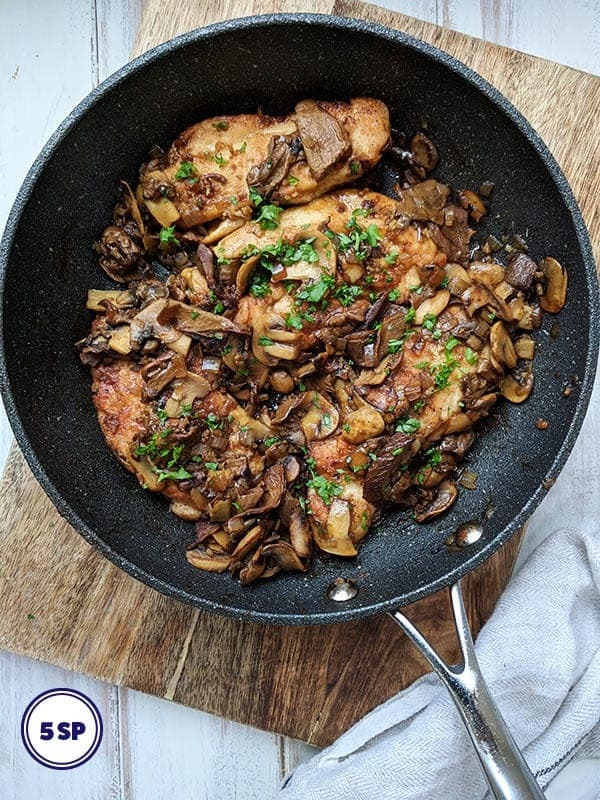 Use a large skillet, like this one available from Amazon. I love Le Creuset casserole dishes, like this one, available from Amazon. I like to serve the Chicken, Leek and Mushroom Pie with garden peas. Serve it with any other free point vegetables for no extra points. Alternatively, if you have SmartPoints to spare this pie would work well with a small serving of new potatoes and some carrots and peas. 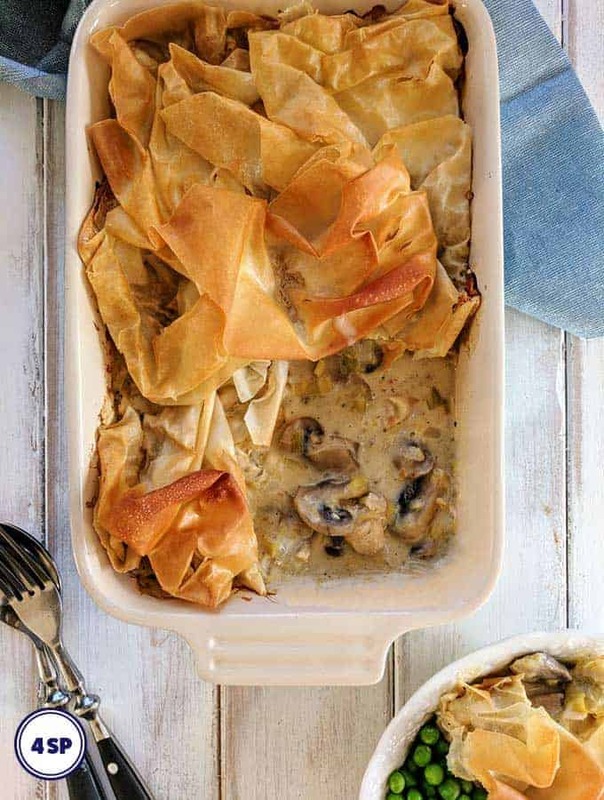 This creamy Chicken, Leek and Mushroom Pie is 4 SmartPoints for a generous helping. 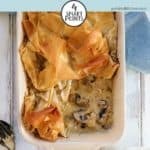 Serve with garden peas for a low SmartPoint WW dinner. Heat the olive oil in a large frying pan / skillet over a medium heat and add the chopped onion. Fry for 2 - 3 minutes, stirring until the onions have started to soften slightly. Add the garlic and continue to fry for 1 minute before adding the chopped leeks. Add a splash of water if it looks like the onions or garlic are going to stick to the pan (this really depends on how non-stick your pan is!). Stir for a further 2 - 3 minutes until the leeks start to soften and they begin smell wonderful. Add the sliced mushrooms and stir for 3 - 4 minutes until they have softened slightly. Again, add a splash of water if needed. Add the stock, stir, turn up the heat and bring to the boil. Once the mixture has started to boil, reduce the heat and simmer for 10 minutes before adding the chicken pieces. Stir, then leave to simmer for a further 15 minutes, stirring occasionally. By this time the stock should have reduced by about 1/3. Turn off the heat, season with salt and pepper and stir in the cream cheese. Spoon the filling into an oven proof dish. Cut each sheet of filo / phyllo pastry into 2. Spray each piece with 4 or 5 pumps of spray oil. Scrunch up the pastry and lay it on top of the pie filling, oil side facing up. Place in the preheated oven for 15 - 20 minutes until the filo pastry has turned golden brown. Check after 12 minutes just to make sure that the pastry isn't browning too quickly. Remove from the heat and serve with garden peas. 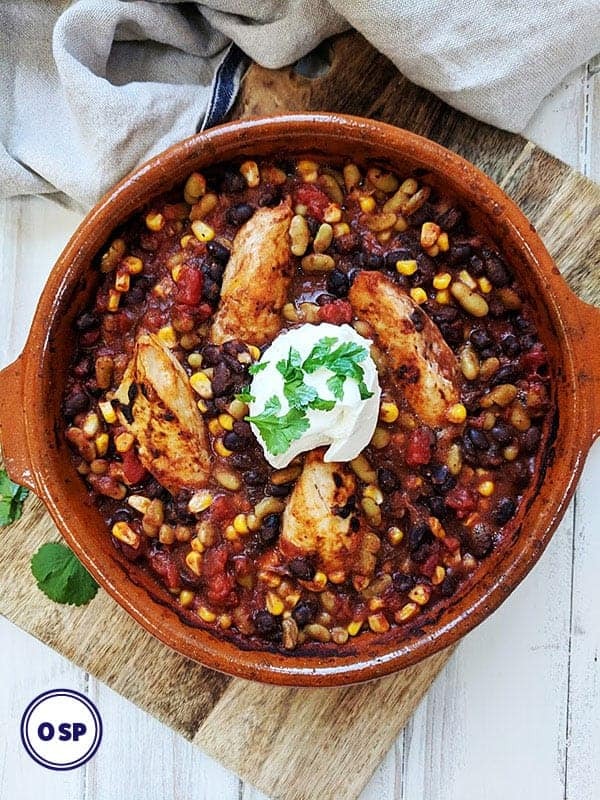 Love the way the recipe is laid out….. how many servings is this? Thanks!